As the sport of climbing grows, performance related nutrition seems to be gaining momentum and interest within the community. While different bodies function best under different conditions, increasing your kale consumption might be just what you need to stay healthy and train hard for this year’s goals. After all, if Tommy Caldwell and Kevin Jorgenson ate kale while climbing the Dawn Wall it can’t hurt, right? It’s an anti-inflammatory food: After a hard day of contorting your digits into thin cracks or crimping micro edges, it’s not uncommon to wake up to sausage fingers. Just as you should stay away from inflammatory foods (like tomatoes) before a sending day, anti-inflammatory foods can help reduce swelling from periods of hard climbing. Kale is so effective as an anti-inflammatory it not only helps prevent but can also reverse effects of chronic inflammation (including arthritis). It’s high in manganese: Manganese is an important mineral for the formation of connective tissue. Consuming the recommended portions can aid in injury prevention as well as the body’s ability to heal connective tissue injuries. Kale is a great source of manganese, packing in 27% of the recommended daily intake in one cup (cooked). It’s high in vitamin C and A: During periods of heavy training we are processing high quantities of food and oxygen into energy, creating a byproduct known as free radicals. Consuming adequate amounts of antioxidants (such as vitamin C and A) helps to neutralize free radicals and reduce risk of damage to our cells as well as improve recovery. It’s a high fiber, low calorie food: While the importance of protein and vitamins/minerals in an athlete’s diet receives a great deal of attention, dietary fiber rarely makes headlines. Kale is a great source of fiber and only contains 0.6 grams of fat. This means you can enjoy all the health benefits of kale while achieving or maintaining a healthy sending weight. It keeps better than other greens: There’s nothing worse than a box of crisp, mixed greens gone slimy. Whether you’re on a climbing road trip, have the convenience of a refrigerator, or are trying to send the Dawn Wall, it’s undeniable that kale lasts longer than other greens. Heat the oil in a pot over medium heat. Add the garlic and crushed red pepper. After a minute or so, add the kale, lemon juice, and a pinch of pepper. Toss to wilt the greens. 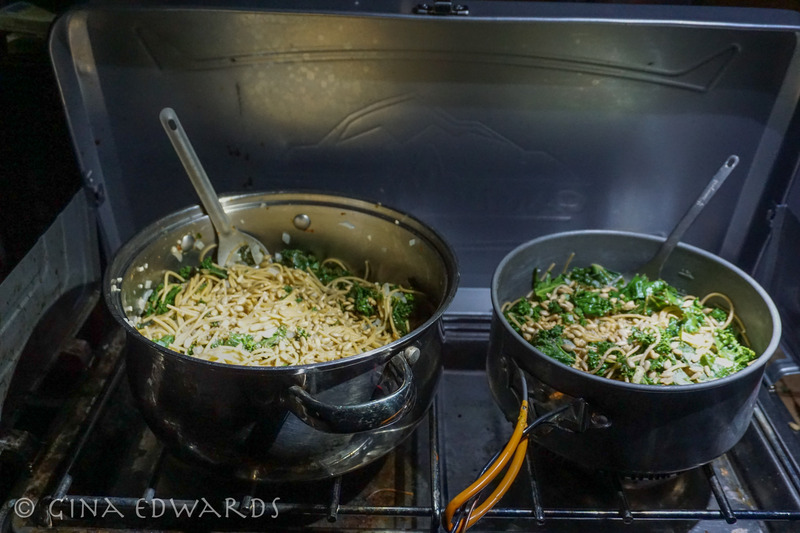 In a second pot, bring water to a boil and cook the spaghetti. Drain it and mix with the kale. Sprinkle with Parmesan cheese. Ehrlich, Steven D. “Manganese.” University of Maryland Medical Center. N.p., 10 July 2011. Web. 13 Mar. 2015. <http://umm.edu/health/medical/altmed/supplement/manganese&gt;. “Antioxidants: Beyond the Hype.” The Nutrition Source. Harvard School of Public Health, n.d. Web. 11 Mar. 2015. <http://www.hsph.harvard.edu/nutritionsource/antioxidants/&gt;. “Health Benefits of Kale: Why Kale Is Superfood No. 1.” Health Benefits of Kale: Why Kale Is Superfood No. 1. N.p., n.d. Web. 11 Mar. 2015. <http://www.healwithfood.org/health-benefits/kale-superfood.php&gt;. Great article! I’m going to grow you lots of kale this summer! Going to start it in the greenhouse this weekend.